Professor, Academician, Nikolai Fedotovich Izmerov, 19 December 1927 – 23 December 2016. Director Emeritus of the Russian Research Institute of Occupational Health, RAMS. A sad message from Moscow just after Christmas told that a long-time occupational health leader and colleague, Professor Nikolai Izmerov had passed away. Nikolai Izmerov’s life story from the Kirgizian mountains to the national and global top of health research and policies was as impressive as it was successful and influential. After graduation, clinical training in hygiene, he completed his PhD thesis on air pollution by gasoline vapours and exposure limits. He moved in 1954 to Moscow and made his postgraduate training there. In 1960, he was invited to the Ministry of Health, and his track as health administrator developed fast; he was serving as one of the youngest assistant ministers of health in the Soviet Government. He developed and organized the environmental and public health and hygiene services for the whole Soviet Union. As the Chair of the National Hygiene Standard Committee, Nikolai Izmerov was highly active in the development of standards for general hygiene and environmental health. As the standard setting for those sectors was even internationally still in infancy, the work was a real pioneering exercise. The next challenging invitation came to serve as the Assistant Director General of the World Health Organization, WHO, in Geneva for the years 1964-1971. There he was responsible, among others, for environmental health, including the WHO contribution to the assessment of environmental toxicants, water and air pollutants. He guided the Member States to establish National Water Programmes and was most instrumental for the WHO contribution to the UN International Water Decade 1965-1974. Here his experience in environmental hygiene standard setting was of utmost value. After his return to Moscow in 1971, Professor Izmerov was appointed as the Director of the Institute of Industrial Hygiene and Occupational Diseases, Academy of Medical Sciences, later known as the Russian Research Institute of Occupational Health, RAMS. He developed the Moscow Institute to one of the leading occupational health institutes in the world. His own research work continued at high level and he wrote key Russian textbooks on industrial toxicology and occupational diseases. Many of the toxicological research results were used in international risk evaluations, e.g. by the WHO and the International Programme on Chemical Safety (IPCS-IRPTC). On the basis of his research career he was appointed first as corresponding and later full member of the Russian Academy of Medical Sciences. He also served as the chairman of the National Scientific Committee on Hygiene and Occupational Diseases, which led him back to standard setting and setting the list of occupational diseases. The work, among others, covered maximum permissible concentrations, MPCs, to the most important industrial chemicals and physical factors, including radiations and drawing up the official list of occupational diseases. Internationally Professor Izmerov was active during his whole professional career. Already before the WHO post he was responsible for the external relations of the Soviet Ministry of Health. The WHO work naturally was fully international. He continued international activities at high level also as the Institute Director, which internationalized the whole RAMS Institute. He was a founding member of the Global Network of the WHO Collaborating Centres in Occupational Health and the respective European Network. As a Director of a leading Occupational Health Institute, he was in 1994 one of the signatories of the WHO Declaration on Occupational Health for All (http://www.who.int/occupational_health/en/oehdeclaration94e.pdf?ua=1). Personally, he was an active ICOH member from the year 1977 and constant contributor to and participant in ICOH Congresses (last time in 2015 in Seoul) and also in many Scientific Committee meetings. In the recent years, he was internationally very active in the protection of reproductive health of female workers and occupational health for health care workers, and environmental and occupational health impact of the climate change. He also contributed actively to ILO programmes and was one of the co-editors and authors of the ILO Encyclopaedia including the third edition with Luigi Parmeggiani (1983) and the fourth edition, Chapter 16, 1998. 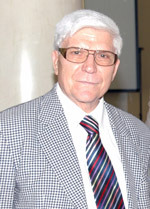 Furthermore, he was instrumental in producing the Russian language version of the 4th edition as a Member of the Editorial College, published in 2001. Nikolai Izmerov was a warm personality, highly dedicated occupational and environmental health leader, educator and researcher. For his colleagues all around the world he was a fair and faithful Friend. He was great enough to tolerate also deviating scientific and policy opinions and still kept the friendship. Many of us, ICOH members, remember with warm feelings him as a person and great experiences with him during many decades. 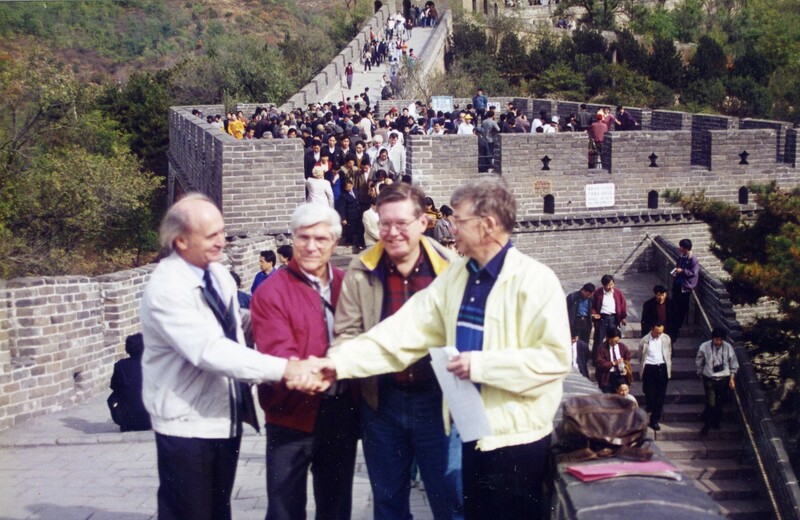 Handshaking on the Great Wall of China by the Signatories of the WHO Declaration on Occupational Health for All. The representatives of the founding Institutes of the WHO Global Network of Collaborating Centres in Occupational Health from left to right: Professor Mikhail Mikheev, WHO, Professor Nikolai F. Izmerov, RAMS, USSR, Dr. Richard A. Lemen, NIOSH USA, Professor Jorma Rantanen, FIOH, Finland. The fourth Signatory, Professor Fengsheng He, CDC China, signed the Declaration in Beijing. N.F. Izmerov, Control of Air Pollution in the U.S.S.R. World Health Organization, Public Health Paper No. 54, Geneva, 1973. Izmerov N.F. Principles underlying the establishment of air quality standards in USSR Science and Public Policy (1974) 1 (9): 230-233. Izmerov NF. 1984. Scientific reviews of Soviet literature on toxicity and hazards of chemicals. Antimony. Moscow: International Register of Potentially Toxic Chemicals (IRPTC) and Centre of International Projects (GKNT). Report no. 71. 24 pp. Izmerov NF, ed. (1985) Beryllium. Geneva, International Register of Potentially Toxic Chemicals; Moscow, Centre of International Projects (Scientific Reviews of Soviet Literature on Toxicity and Hazards of Chemicals Series). Izmerov NF. Current problems of nonionizing radiation. Scand J Work Environ Health. 1985 Jun;11(3 Spec No):223-7. Izmerov NF, Fedotov IA. Labour Protection in the Russian Federation: Law and Practice in: chapter 16. Occupational health services. ILO Encyclopaedia, Fourth edition 1998. Chapter Editors: Igor A. Fedotov, Marianne Saux and Jorma Rantanen. Izmerov NF, Sivochalova OV, Fesenko MA, Denisov EI, Golovaneva GV. The issues of workers reproductive health protection from harmful occupational and environmental exposures. Vestn Ross Akad Med Nauk. 2012;12:47–53.